How successful traders think, trade and invest...Insights into successful trading. plan consistently); the ability to cope with losses, which are inevitable even for the successful trader. How successful traders think, trade and invest...Insights into successful trading. 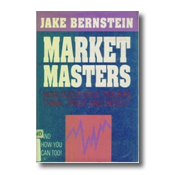 Jake Bernstein outlines how the weakest link in the trading chain is the trader: No matter what trading system is employed, the system will fail if the trader lacks the discipline to stay with the plan long enough to allow it to succeed. He identifies three building blocks for success: a trading system that has shown consistency and profitability for a significant length of time or for a significant number of trades; discipline (the ability to formulate and plan, then implement the plan consistently); and the ability to cope with losses, which are inevitable even for the successful trader.